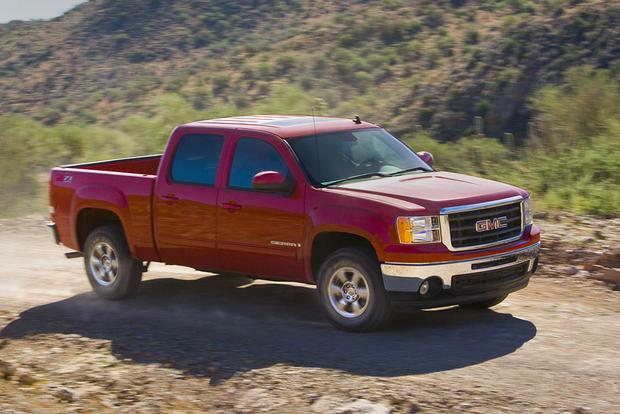 Buying Used Pickup Trucks: What Should You Look For? Is there a more exciting vehicle segment right now? Maybe not. Here's how you can pay big money for a British car. The new Supra is absolutely covered in them. Buying a used pickup truck is a lot harder than buying a used car. Used pickup trucks have often lived a harder workhorse-style life, which means there's more to consider when you're buying a truck than when you're buying a normal family sedan or minivan. So just what should you look for? We have some answers that can help you when you're checking out a used truck. One thing you'll have to consider when buying a used truck is just how much towing and hauling the previous owner has done. Obviously, this isn't something you'll need to think about if you're buying a hatchback or a convertible, but trucks are different. If a truck has spent 50,000 miles hooked up to a trailer, it may have caused more than normal wear on the truck's mechanical components. Of course, one way to find out just how much towing and hauling a truck has done is to simply ask the owner. But since you can't always count on the truth from someone selling a used car -- and since you can't always count on a dealer to know the whole story -- we recommend taking the truck for a mechanical inspection before you buy it. We especially recommend this if you see evidence of a lot of towing, such as a well-worn tow hitch, a severely bent rear license plate or a cable for wiring a trailer's brake lights. Another thing you'll need to consider when buying a truck is exactly how it's been used. Many used pickup trucks lead pampered in-town lives, but some are used in fields, on farms or on ranches -- exactly as they were intended to be. The problem with this sort of use, however, is that it can cause a lot of wear to a truck's suspension, chassis and other components. To check for off-road use, get under the truck and take a look around. If you see a lot of scratches, scrapes and bent parts on the truck's underside, it may have had a rough life off-road. While this isn't necessarily a reason to avoid a truck, it's certainly a red flag that may warrant a mechanical inspection by a professional. Many trucks are bought by businesses and used as workhorses in a wide variety of applications, including shuttling around the foreman and hauling serious debris and heavy goods. Because so many trucks are used by businesses, we wouldn't tell you to avoid a truck that's had commercial use, but we do suggest paying a mechanic to check it over before you buy it. Businesses aren't always as careful with maintenance as private owners, and you'll want to be sure that no important services were skipped. Buying a used pickup truck is hard, since used trucks have often had a rough life. But if you follow our suggestions and thoroughly check out any truck before you buy it, you'll probably end up with a used pickup that serves you well for years to come.